Stallion Alert - Record Collecting - Portland, OR: White Whales. There's a short segment in the movie Vinyl where Alan Zwieg talks about (and I'm paraphrasing here) the thrill of hunting down that record you've always been looking for–your "white whale," as it were. 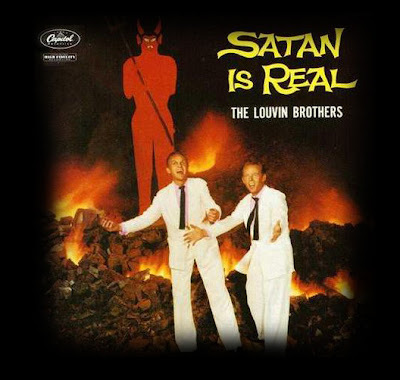 In his case, he had always–for reasons even he was unsure of–wanted a copy of The Louvin Brothers' Satan is Real LP. Can't say I blame him; it's a sweet looking record. He ends up meeting a guy who was an avid collector of classic country music, and he figures out that the dude has a copy of the album in his storage unit. They go look for it, find it, and even though the fellow won't sell it to him, he's still able to admire it while holding it in his hand. He talks about it afterward, while still struck with some unexpected confusion–as soon as it became real, it was almost a letdown. Of course, he didn't actually buy the record, so he's still got that project to tackle, if he chooses to. But he didn't seem as excited about it. 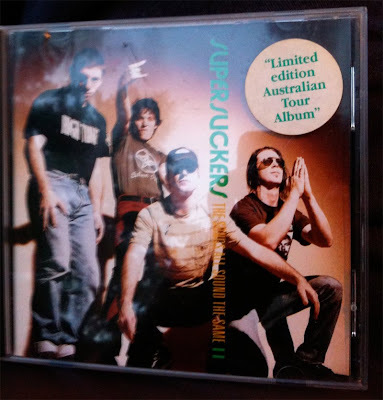 In 1994, the Supersuckers put out an Australian-only tour album called The Songs All Sound the Same II (as it's listed on the cover) aka Put This on the Barbie, Fucker (as it reads on the spine). When I was 18 and living in Eugene right after high school (in 1994), I came across this CD at a local record shop. I was incredibly broke, and though I really wanted it, I literally didn't have the money. A few weeks later I pointed it out to a friend who was in town visiting, and he bought it. That was the last time I ever saw it. I don't know how it even ended up in the States, let alone in Eugene. But there it was. And there it went. And when I bugged my friend years later to sell it to me, he wouldn't do it. And he didn't even really like the band that much. And then I lost track of him. Like I said, my Supersuckers collecting has been known to wane depending on my funds and my general laziness, but it's always there. When I started using eBay a decade ago, it gave me a streamlined way to stalk the band's products. I have purchased way too much Supersuckers stuff from eBay, but I never saw my white whale on there. I took to emailing people I saw selling rare Supersuckers stuff on eBay and asking them if they had it. I emailed the band's manager to see if he could help me get it. I searched the web high and low, only to find that there's barely any record of it existing. About a year ago, I set up a Google Alert for the CD, just to see if that would get me anywhere. I kept getting random alerts that didn't have anything to do with the album. Then, a few short weeks ago, I finally got the alert I had been waiting for: a record store in Australia had a copy on their site for 15 bucks. I ran for my wallet, frantically moving to swipe it up before someone else did (this is how crazy I am), typing in my credit card number and waiting for it all to go through. It did. And I waited. I always thought I'd come across it in a record store. I always thought I'd pay way too much money for it. I always thought it would be this huge event that I'd have a great story to go along with. Nope. I found it on the internet for 15 bucks and they sent it right to me. Huh. And while I'm going to miss always having that CD out there eluding me, I have to say: I've been looking at it all night, and finally having it really is as good as I hoped it would be. Now: does anyone know where I can get a copy of Nirvana's "Love Buzz" 7"? Congratulations to you! I can verify that this has been a longtime obsession. I never even had the pleasure of seeing it before and it is not at all like I had envisioned. I always imagined that the cover would be some sort of play on the "The Songs All Sound The Same" cover. This cover makes it look more "La Mano Cornuda" era but maybe that is just me. Shame on you for getting it a week after I visit. Now I have to wait at least 6 months to take a look at it. One of my "white whales" is a compilation 45 called "The Amazing Phantom Third Channel." I want it as it is the only Crayon release that I do not own (save for some self-released cassettes but I act like those don't exist). The problem is that the comp has a very early song by Neutral Milk Hotel, a band I could care less about, so these sell for around $100 when they show up on ebay. Needless to say I always check for this in 45 bins in hopes of finding it for cheap but my chances are pretty much nil. Damn this collecting!